I had come to Portugal out of curiosity. While traveling through Asia last year I had seen the footprints of Portugal everywhere from Goa to Macau, but never a single Portuguese. I felt like some sheriff from a cheesy western movie, always on the heels of his man but never finding more than a smoldering campfire. What explained their presence only in the past and their absence in the present? Later that first day I sat on a park bench in downtown Lisbon and mulled this question. It seemed to me that 21st century Portugal is a shadow of its golden age in the 15th and 16th centuries. They were some of the first to sail around the world, found distant colonies and maintain profitable trade routes. They grew rich from their colonies in Asia, Africa and South America. But then the massive 1755 Lisbon earthquake destroyed most of the city and crippled the empire. Napoleon’s invasion and the granting of independence to Brazil compounded Portugal’s decline. In the 20th century, Portugal was ruled by the Europe’s longest standing dictatorship under Antonio Salazar and his successor. Today, Portugal has the lowest GDP per capita in Western Europe. The Economist recently referred to it as the ‘new sick man of Europe.’ Its low wages used to attract foreign investment, but that capital moved to Eastern Europe once wages rose too high (though current average GDP per capita is only 800 € per month – about $1,200). The only traces of their colonial empire are the Angolan and Indian restaurants. Portugal is a drag on the Euro. Many products sold in the EU have two prices on their tags: one for Europe, and another for Portugal and Greece. These two countries, together with Italy and Spain have recently been dubbed as the P.I.G.S. of Europe, the acronym denoting the four nations that are holding back Europe’s economy. The low prices were fine by me. Portugal is one of the few Euro-Zone countries where a Spanish wage will actually buy you something. For example, compare coffee prices: 4€ at a Parisian café, 2.5€ in Dublin, 1.5€ in Madrid, but never above .80€ in the swank cafés of Lisbon. Lisbon is the economic powerhouse of Portugal. It produces a third of Portugal’s GDP, but as I walked around during rush-hour I thought it felt more like a village slowly waking up than a major financial city. Take, for instance, the park I was sitting in. It was surrounded by centuries-old townhouses with façades crumbling from neglect. Cracked ceramic murals depicting mighty Portuguese galleons were ironically juxtaposed next to the abandoned mansions of Portuguese nobles. Broken buildings remained un-mended, walls un-painted, and streets un-swept. Yet none of this mattered to me. I found Lisbon shabby yet charming. That weekend I spent three days walking up, down and around its seven hills. I wandered its narrow cobbled streets and lost myself in their endless twists and undulations. I ducked down alleys and followed wall after wall of beautiful graffiti. Yellow painted street cars carted tourists from one side of Lisbon to the other and I jumped in and watched people getting on and off. The summit of each hill afforded me a unique view of Lisbon. I climbed up to the stone fortress that surmounts the largest hill and smelt the fresh winds blowing off the Atlantic. I walked to the harbor and imagined hopping on an ancient galleon and sailing across to Brazil, Mozambique, Goa, or Macau. I brought my notebooks with me and spent the afternoons working on my book. As charmed as I was by the city, I couldn’t help wondering about the future of such a nation in our globalized economy. Modern economic theory rests upon the assumption that every nation produces at least one thing better than any other nation in the world. This is the country’s niche, and free trade works because each country exports its niche product and imports the specialties of its trading partners. What are Portugal’s niche products? The first is Port wine, the sweet dessert wine from the vineyards around the northern city of Porto. The second is cork. Portugal is the world’s largest producer of cork in the world. But what happens if Port wine falls out of style or we replace organic corks with lower-cost plastic substitutes? An old man approached me as I sat on that bench in downtown Lisbon, mulling this all over. He was my father’s age and wore a tweed jacket and a hat reminiscent of a 1930’s paper boy. He smiled at me and asked me in Portuguese if I wanted to buy hashish or cocaine. I politely declined in Spanish. ‘Heroin?’ he asked. Tampoco. Sic transit gloria. Yes, the empires of Europe have all crumbled. 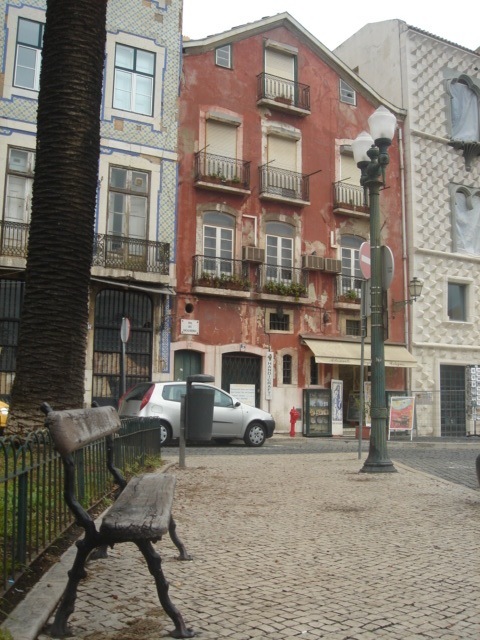 And in downtown Lisbon in 2010 it may be easier to find hash than a well-preserved building or a 2€ coffee. But what a charming place to visit.